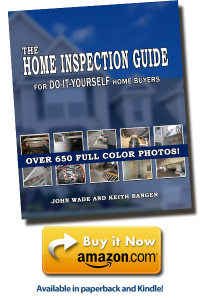 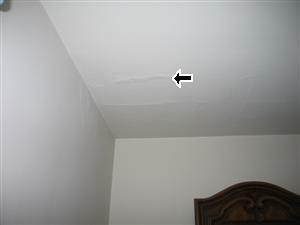 It is very important to look for water stains across all the ceilings of the home. 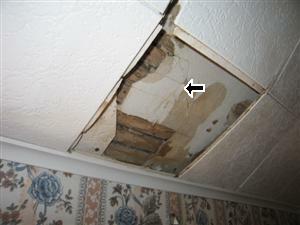 Always check for ceiling / supporting. 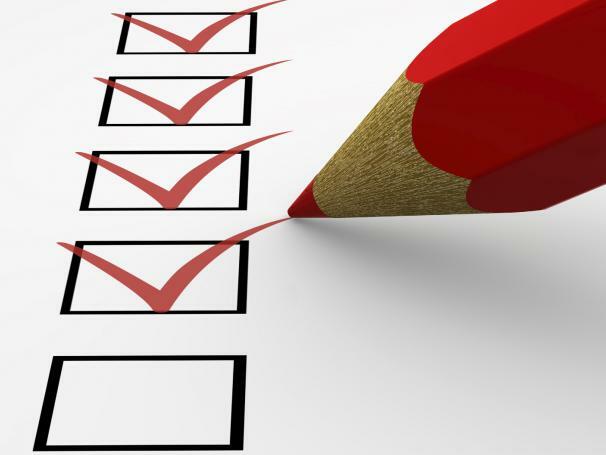 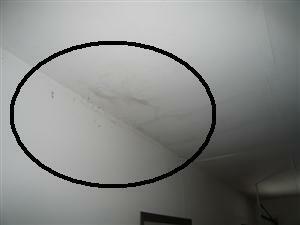 Water stains on the ceiling, always check below bathroom and kitchens or where there is running water. 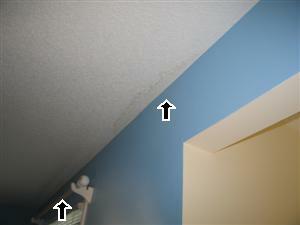 Water stain on a ceiling, if a stain is on the main floor what is directly above? 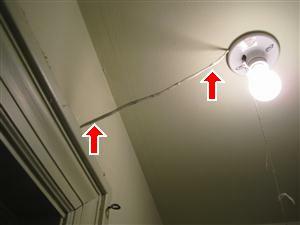 In a two story home this will generally tell you where the problem is coming from. 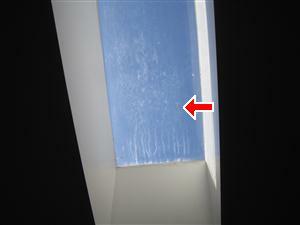 Water stain on a on a exterior wall, this is generally caused from ice backup in the winter. 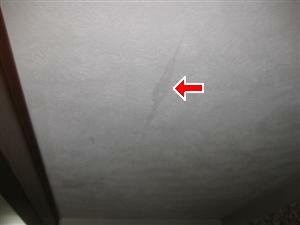 Water stain on a ceiling, most times in a one story home the water had come from a chimney flashing leak,or a roof vent leak, or a roof valley leak. 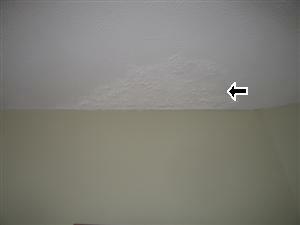 Water stain on the ceiling exterior wall. 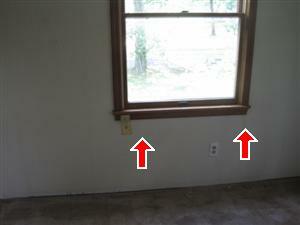 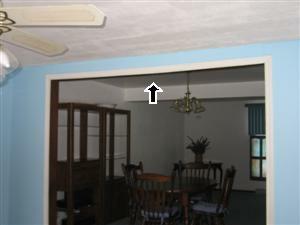 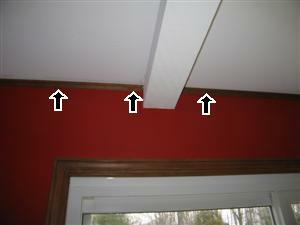 Ceiling drywall sagging, it is very difficult to show a photo of this problem. 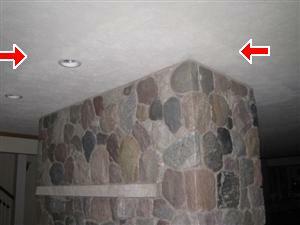 Every home you look at you should look close at the ceiling to make sure the drywall is not sagging, this is very common for homes that were built in the late 70’s & 80’s. 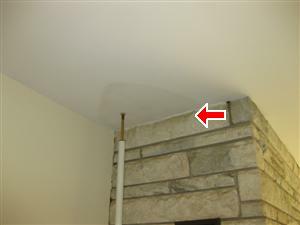 Always check around the ceilings of fireplaces as you can see in this one the drywall has been repaired because of a flashing leak on the roof. 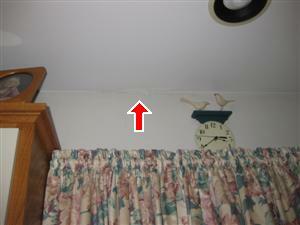 Make sure you look very close at the flashing around the chimney and the sheathing in the attic around the chimney for wood rot. 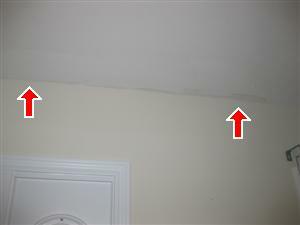 Water stains were found around the chimney this is generally caused because of a flashing leak around the chimney. 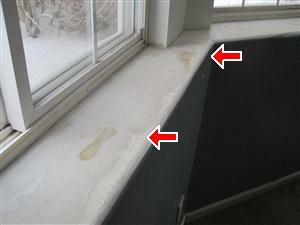 Always check for water stains directly under windows. 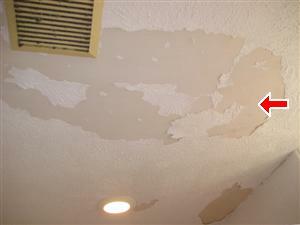 The drywall tape is bubbling up where the ceiling and the wall come together. 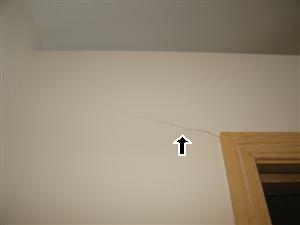 This generally happens because of a chimney flashing leak. 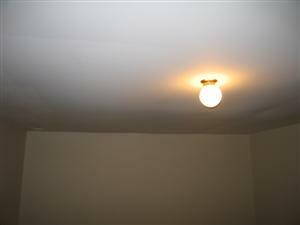 When ever you see a drop down ceiling in the home you are looking at buying it is very important to move the panel to the side and see if the light fixture is wired properly and is using junction boxes to safely to store the wires. 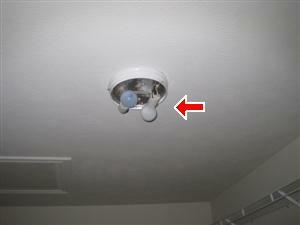 This is common to find in homes with basements. 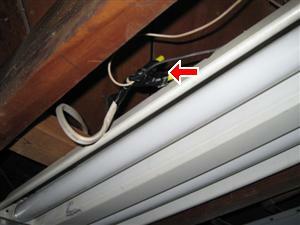 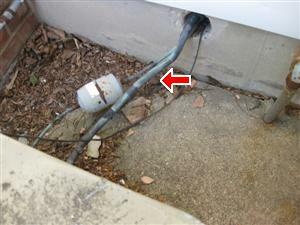 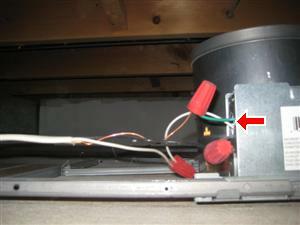 These electrical wires need to be placed into the light fixture electrical box for safety. 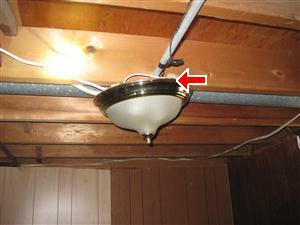 We recommend that all basement light fixtures are properly installed for Safety. 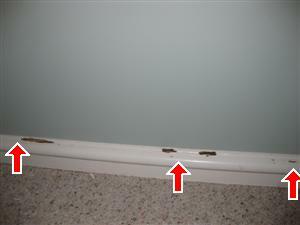 This sliding door has a broken thermal seal. 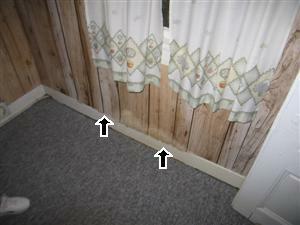 This window has had serious leaks, even if the windows look good and you see curtains are around the windows, gently move the curtains and inspect the windows and the walls, you never know what you will find. 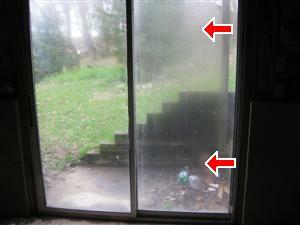 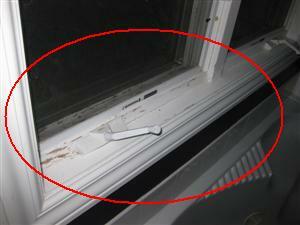 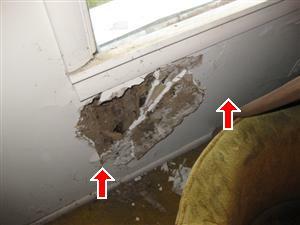 This is a photo of a window frame that is rotted at the bottom corner of the window. 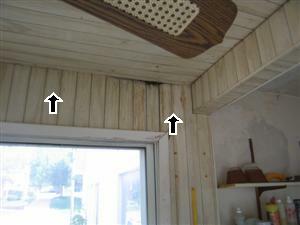 Opening and closing every window is very important, if you see a water stain push your finger on it and see if it is only a stain or if itis wood rot. 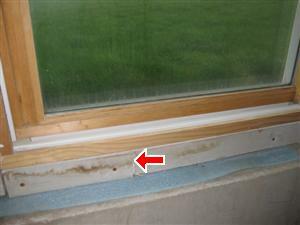 Always check the base of the basement windows for water stains. 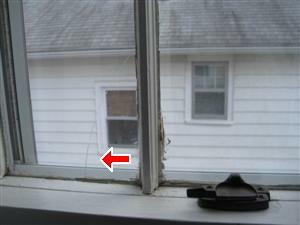 Always look close at the windows, this one has chipping paint, this can be from different things.The humidifier being turned up to high, the window is leaking water or the current owner just leaves there window open a lot. 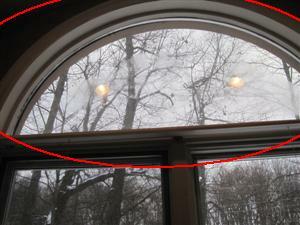 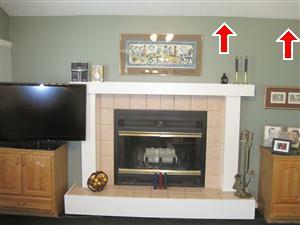 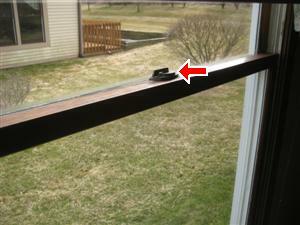 Also open and close every window in the home, while opening them look at the top and bottom of the frames. 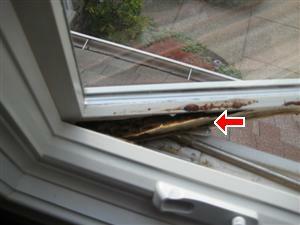 Occasionally you will find the frames are rotted this generally happens at the bottom of the window. 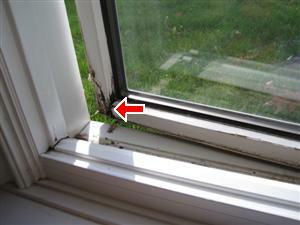 It is very important to open every window in the home because you don’t know when you will open a window and it will be rotted like this one. 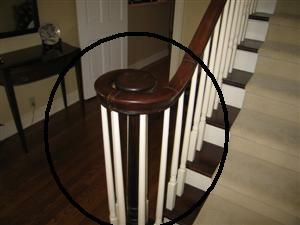 Every home that needs a railing or a railing with spindles that should be properly secured for safety. 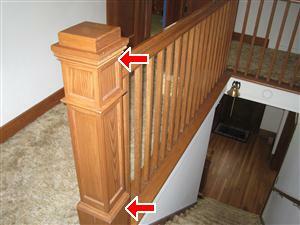 Always check for loose or broken railing spindles. 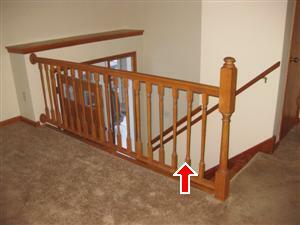 Very common to find loose railings. 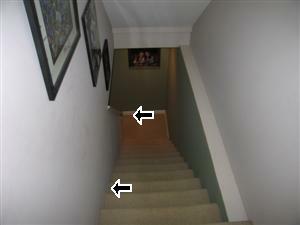 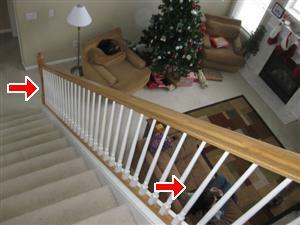 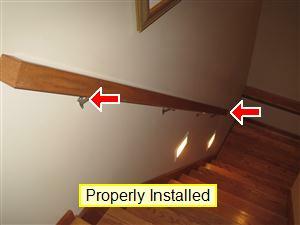 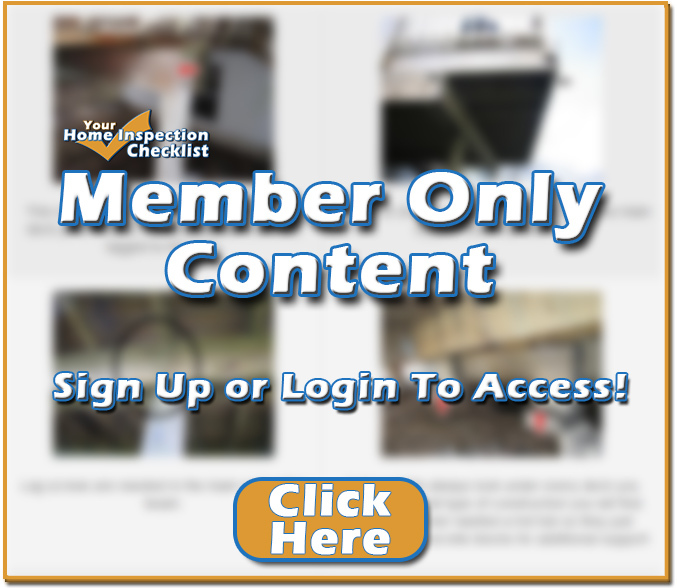 Recommend always check post of railing system to see if they are loose, this is a very common area to find them loose.